P.S. Note that it had been raining and the seller hadn't even bothered to cover it up. Yikes. I'm ashamed to say I lingered over this one for so long that Mr. and Mrs. Beck took me for a total cheapskate who did not want to fork up the very reasonable CHF 20 asking price. 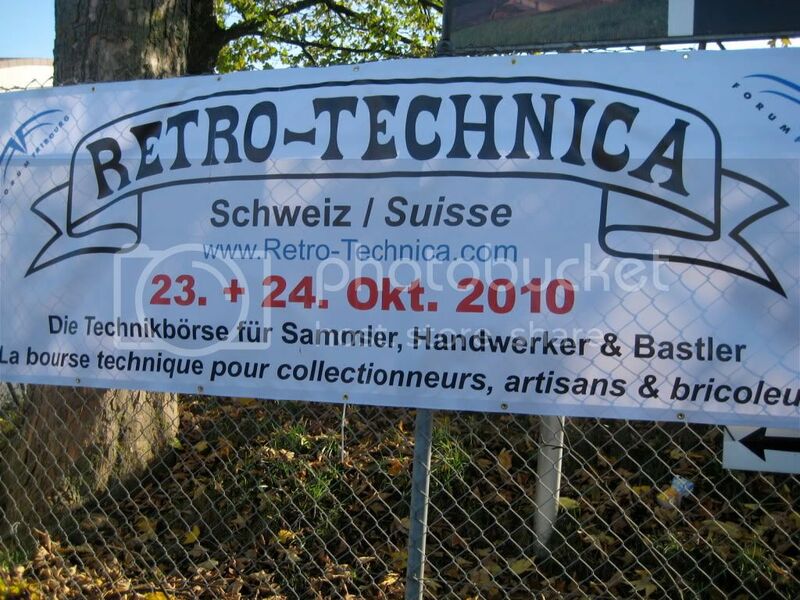 That's the thing about this multilingual country: the Becks spoke German, we did not (seeing as how we live in French-speaking Geneva), and so I could not even introduce myself as a fellow typewriter-enthusiast and trade tips on busted escapements. Pity, isn't it? The funny thing is that we spotted some prospective buyers in a similar predicament who, instead of bargaining verbally, wrote down the proposed figure and showed the paper to the seller, who promptly crossed it out and wrote another. 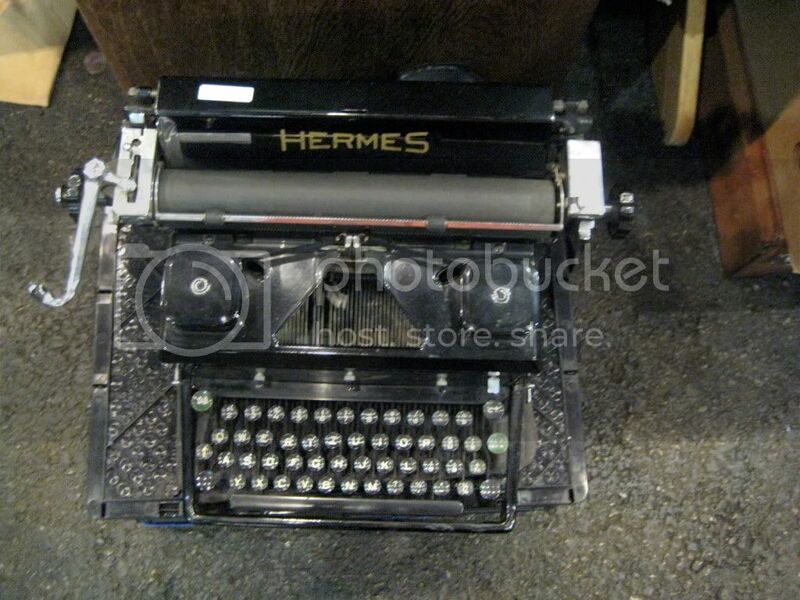 There were also a couple of '50s Hermes Medias and Hermes 2000s, but you already know what those look like. 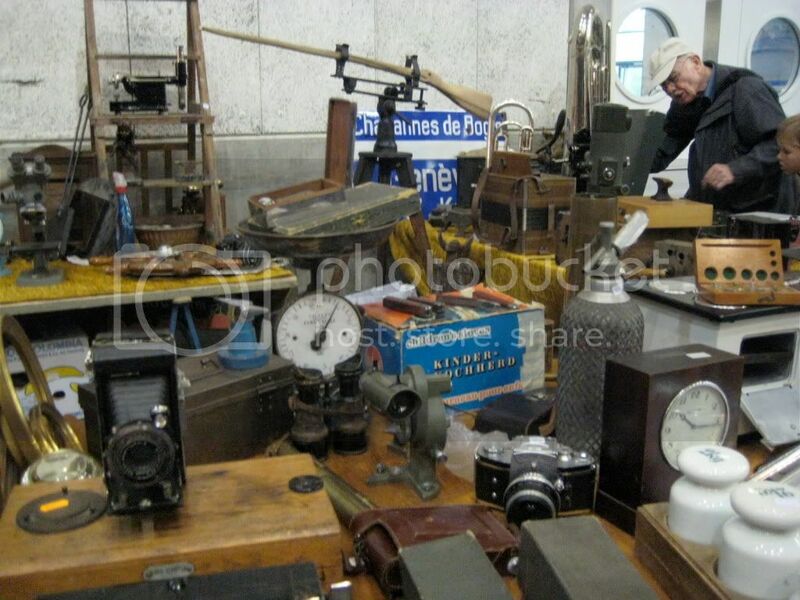 No Hermes 3000s or Media 3s - perhaps they are so common that the sellers did not bother hauling them to this event meant to showcase curiosities? Probably. A Macy's Portable No. 1! This has a special keyboard layout - it looks like Swiss-German, except that it is actually QWERTY, and also includes a couple of special symbols, like the Greek sigma. This Macy's Portable No. 1 typewriter is a relabeled variant of the Barr typewriter, which has been thoroughly documented by Will Davis here. Finds like this make me wish I had a huge house with generous storage space so I could be a real collector! 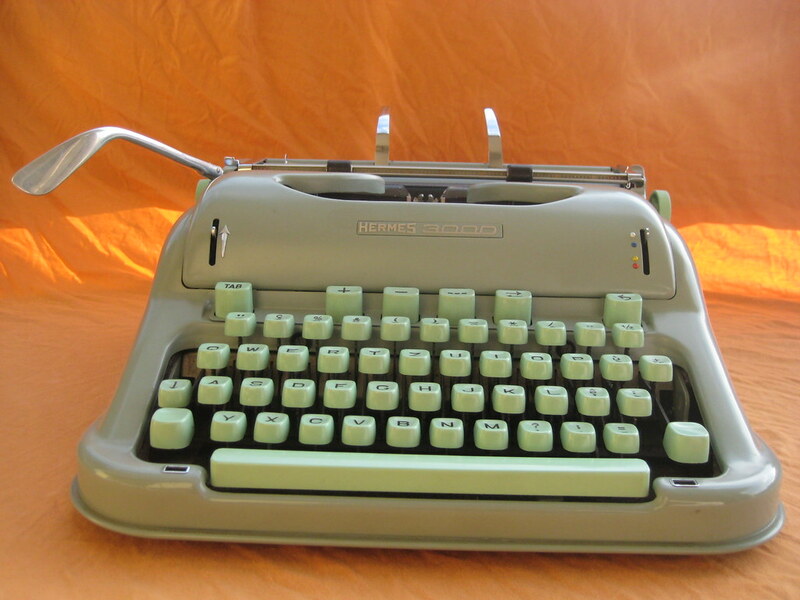 The glass keys on this typewriter were just beautiful - each one as thick as a cough drop. Overall, it was also a good bit smaller than its successor pictured above. 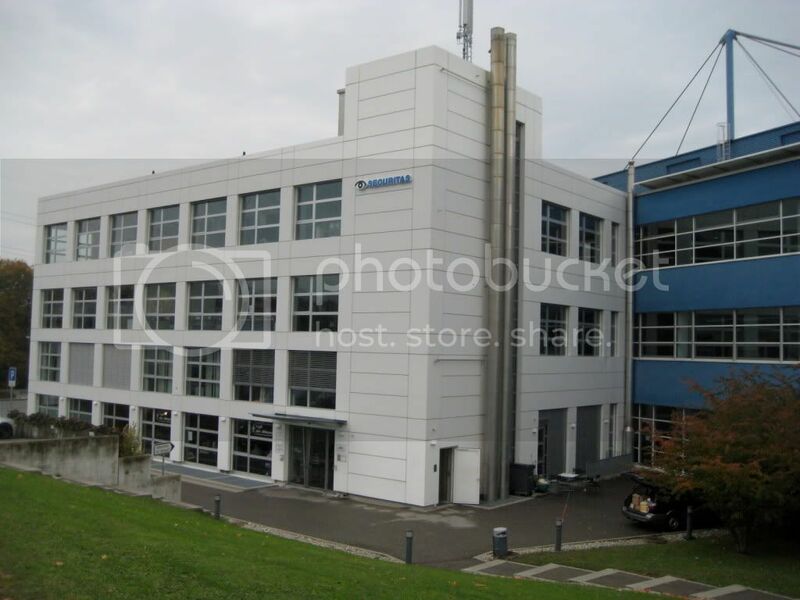 Modest asking price of CHF 20. 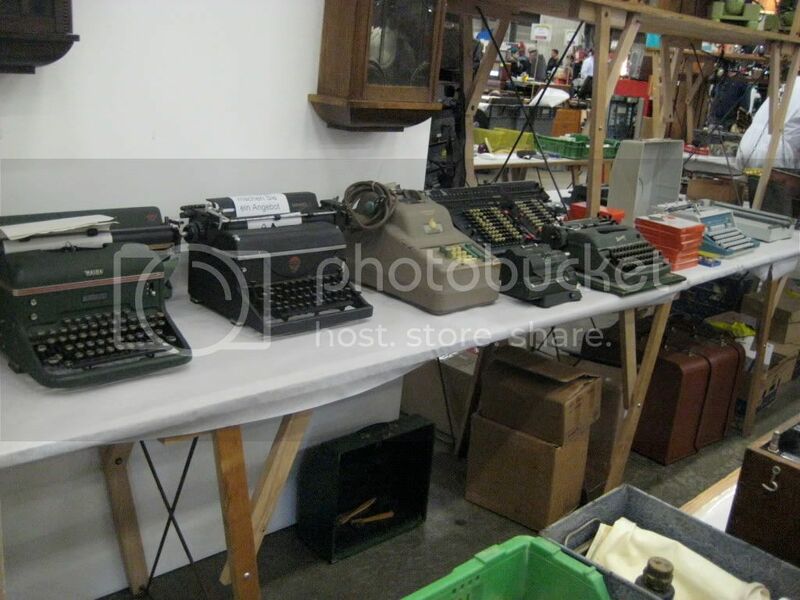 More typewriters, as well as the one machine I wish I could go back in time and bring home with me, after the cut. An Adler Junior 2, balancing precariously on its case. I didn't inquire about the price for this and it wasn't listed. It was in fairly good condition, for what it is, but a perfectly ordinary pica font and plastic case don't exactly pique my curiosity. It was just about impossible to take a head-on picture without having my mug reflected in the glossy ribbon cover, so this was as close as I got. This was straight out of the box, before I cleaned it, if you can believe it. It's always a great feeling to get a machine from someone who obviously cared a lot about it. There was the usual grime/ eraser shavings sticking to grease on the interior, but a few minutes with some cotton swabs took care of that. I like the ornate paper supports on these old machines. I looked up the serial number on this one and it's dated 1956. Which makes me think that perhaps I purchased this from the son of the original owner, because otherwise he would be very old indeed to be carrying large boxes to the post office! Here's a look at the script/ cursive typeface, lightly tinged with green from the ribbon (which didn't show up so well in the typecast, sorry). I wish I knew where to procure these colored ribbons! They're a treat to use. Here is the case, which is made of wood covered in leatherette fabric, and is in good condition considering its age. The bottom is a board on which the machine is fastened, and then the top closes over. I wish these old cases were more streamlined... 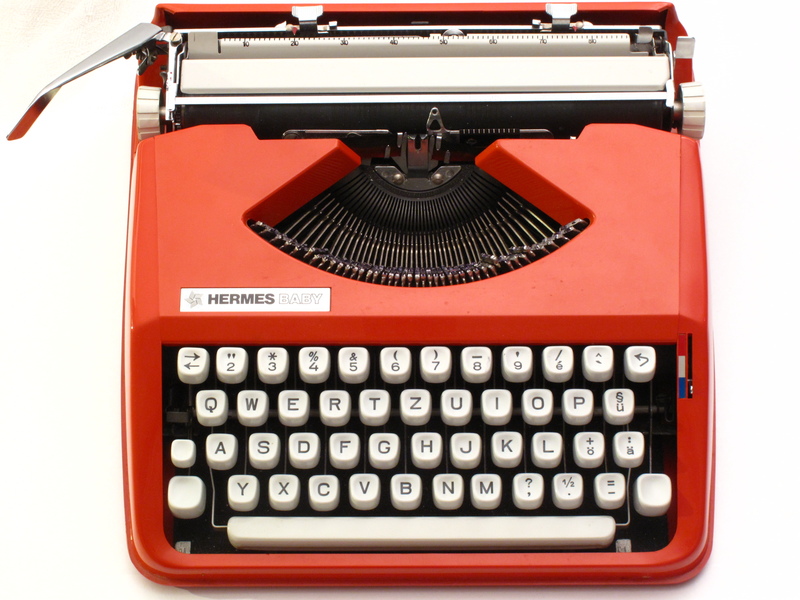 I imagine once the typewriter is in the case, there is still quite a bit of room, unlike the almost-hermetic fit of the Hermes 3000. I saved the Styrofoam pieces and I'm using them to pack a Hermes 3000 that I'm sending overseas. Fingers crossed that the padding works its magic a second time! So, fall is here and I seem to be letting my love of US TV shows (Parenthood! The Good Wife! Community! 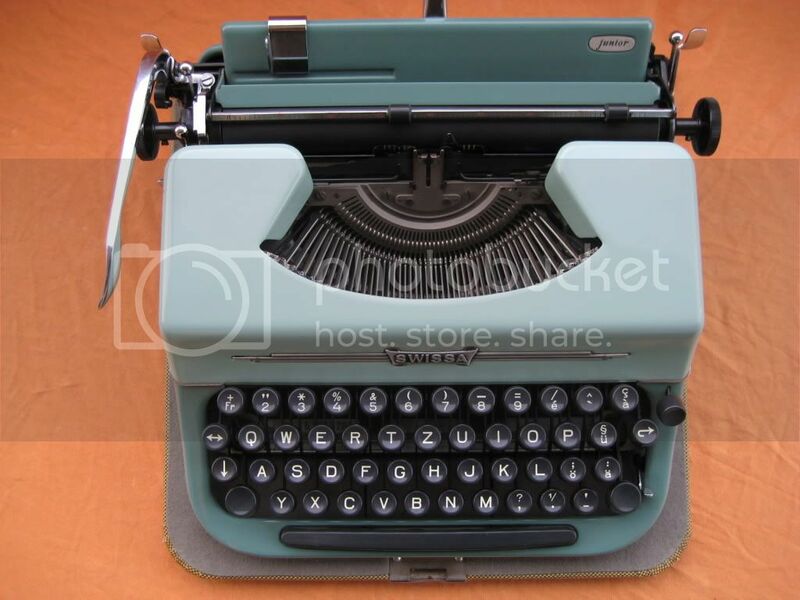 etc...) interrupt my typewriting fervor. I started with these shows when they debuted last year, and now I feel an obligation to the shows' characters to keep watching. For someone who doesn't have an actual television, I can't even pretend to be a TV snob with all the online watching I do. This has upsides and downsides: the negative being that I am not typecasting as often as I should be; the positive being that I am now thinking about something else besides "typewriters! ", and my groaning IKEA shelves can take a breather. Relentless acquisition phase over. I spotted this baby at the local flea market sometime in late May, but I passed it right by because I thought I had enough typewriters (ha. There were only like, six, at the time.). Thereafter, I saw this very machine on Mike Clemens' blog, and after encountering one depressing crinkled gray Hermes Baby after the other, I began reminiscing fondly after this one, the one that got away. It seemed to be gone for good, though. We made cycling to the flea market part of our weekend routine, but no dice. After three months, when I was no longer looking, I happened to walk past that same seller's stall and spotted the elusive typewriter. The case was closed and partially buried under some old crockery; if I hadn't been looking out for it, it is doubtful I would have found it. But find it I did, and there was much rejoicing. After negotiating a fair price with the seller, I hoisted my prize into my backpack and rode back home to clean it up. Having already decimated a couple of painted logos with my overly keen scrubbing, I was extra-cautious with this one. It still suffered a bit, though, but overall looks fairly decent. The label from the Hermes agent in Geneva that sold it, A. Strachan on the Boulevard du Theatre, remains. It's a nice bit of ephemera. A phone book search of the exact address reveals that Monsieur Strachan is long gone, of course, and the building houses a couple of real estate agents. Last Friday, I received this ABC typewriter, which I had picked up for a bargain on a Swiss auction site (please note that this was before my vow of typewriter chastity, which is still going strong). Anyway, ABCs don’t take up much space, so I figured in the worst case I would put it on a shelf in my bookcase and take it out from time to time, just to admire. 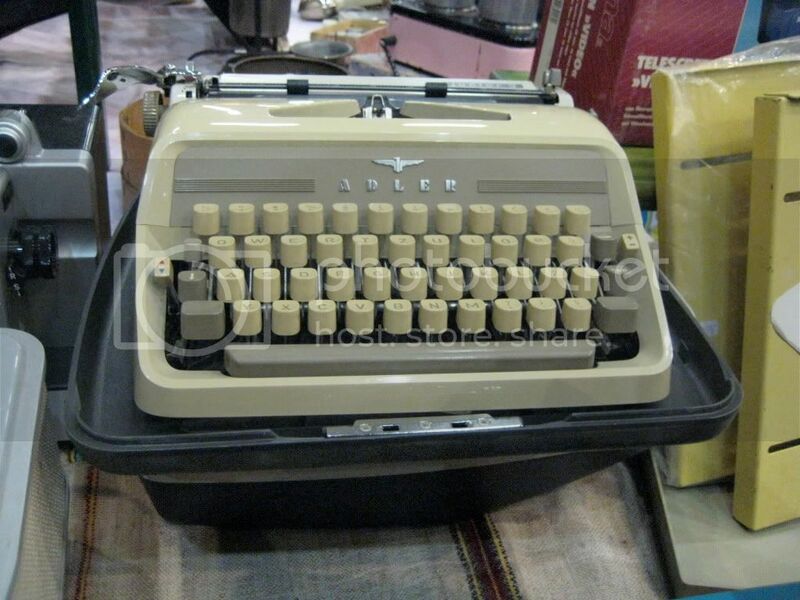 In fact, looking at ABC typewriters seems to be the only thing they’re good for, so that worked out. You see, when I received this machine, the box was rattling ominously. Something was amiss, and once I opened it, the carriage mechanism pretty much fell off in my hands in a hail of screws and washers. This, I did not attribute to careless shipping. I have seen many shipping accidents in my day and they did not involve screws that magically unloosened themselves. Fortunately, I have another ABC - a series 4 in hammertone green, so I was able to study it and figure out where all the screws, springs, and miscellaneous metal bits had to be re-assembled on this ivory Series 3. Without the template to copy, I would have been up the creek on this machine for sure. It ended up well, more or less - I have determined that the paper finger on this machine is missing for good, after shaking it thoroughly to ensure that it was not just stuck in some crevice. At the end of the day, this Series 3 is remarkably similar to my Series 4. There are small differences: this came in a soft leather-like case (which was shot, by the way), and so the best way to use it is with a typing pad of some sort. The protruding metal tabs on either side of the ribbon cover (which, fortunately, were redesigned in the Series 4) serve as a latch to take off the cover. The ribbon color selector is in the same discreet location, though, and the mechanism seems identical. Vanilla and Sage, I call them. Pretty though they may be, each has its own failings - Vanilla is missing a paper support, has some trouble writing in a straight line, and occasionally skips a letter. Sage, while clean and well-preserved, seems to have been well-used and thus has a worn escapement, which leads to margins that refuse to hold and make it virtually impossible to write a straight paragraph. Both of them have backspace problems... I believe it works intermittently on Sage and not at all on Vanilla.